Thermofax Screen Printing Essentials Blog Hop & Giveaway! Lynn Krawczyk has recently published a new workshop on DVD. I LOVE Thermofax screens and use them whenever I can. I was excited when Lynn invited me to review her new DVD class. While I don't feel that Thermofax printing is that intimidating, I know it can be for others and I think that Lynn's DVD takes ALL the intimidation of this process. She walks you through everything from choosing a good image, to how a screen is made, and how to create lots of lovely prints. I especially liked her advice on how to line up the screen to create a two color print. She also shows several fun projects to make. I especially liked her birds printed on ATC's. It gave me an idea for a project my daughter needed some help with. My oldest daughter came home from DC for a brief visit and asked me to help her friend, who was recently baptized, bind some letters from the people at church. 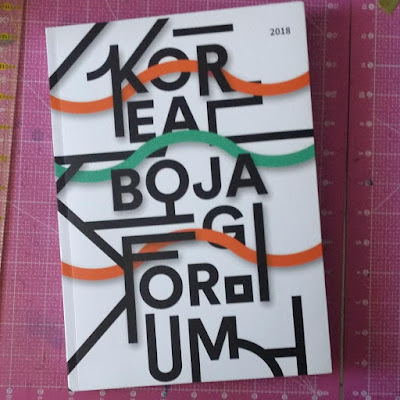 Because of the small margin on the letters, and the thickness of each letter, my first thought was to take them to the print shop and have them spiral bound, however first we needed some covers. 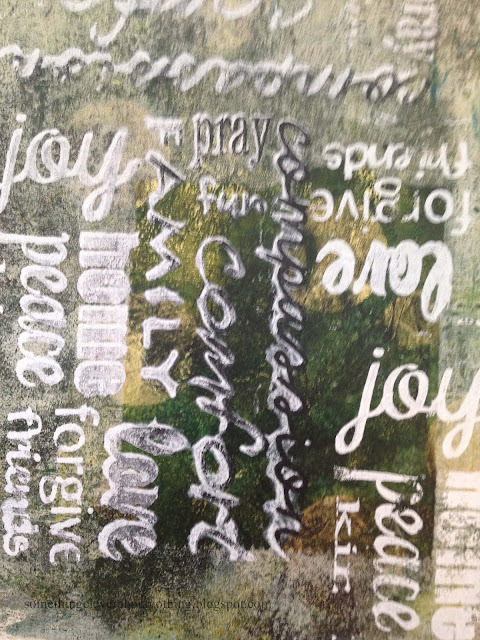 I took some 140 lb mixed media paper and created a few Gelli® Prints. 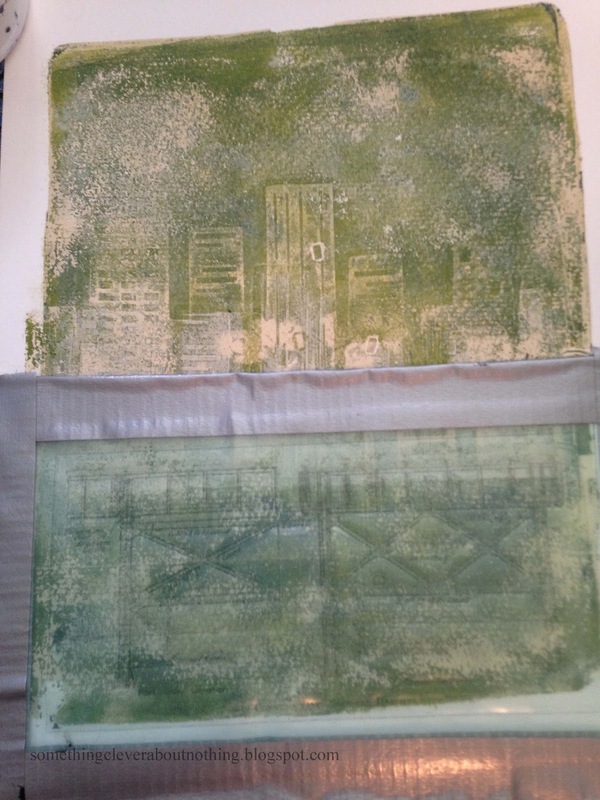 I found out that his favorite color is green and so I proceeded to add some thermofax screening to the green prints I made. This is a screen I had made of a bridge blue print I found online in a free image website. I really liked how the image looked under the city. 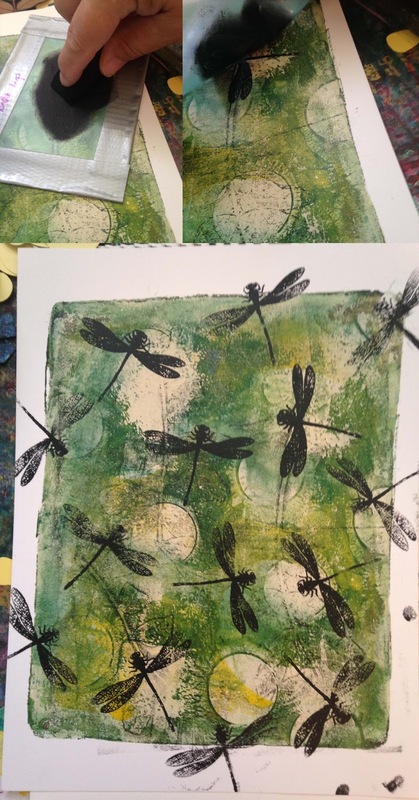 On another of the Gelli® Prints I screened a few dragonflies. I wish I had made them green or perhaps white instead of black, but oh well, I think I like the page anyway. The circles make me think of little moons or lights. I have been a little obsessed with Moon's lately. And lastly I screen a Gelli® print with a word cloud I created for some Prayer Flags. I made the mistake of using a wet foam brush on the first pass and so the paint smudged. I took care of this by lightly going over the words in black. This page ended up being his favorite and therefore became the front of the book. To make the front and back pages a little stronger I Mistyfused the printed pages to another piece of Mixed Media paper. Once these were fused I took them to the copy shop where they worked their magic, giving my daughter's friend a priceless memory! 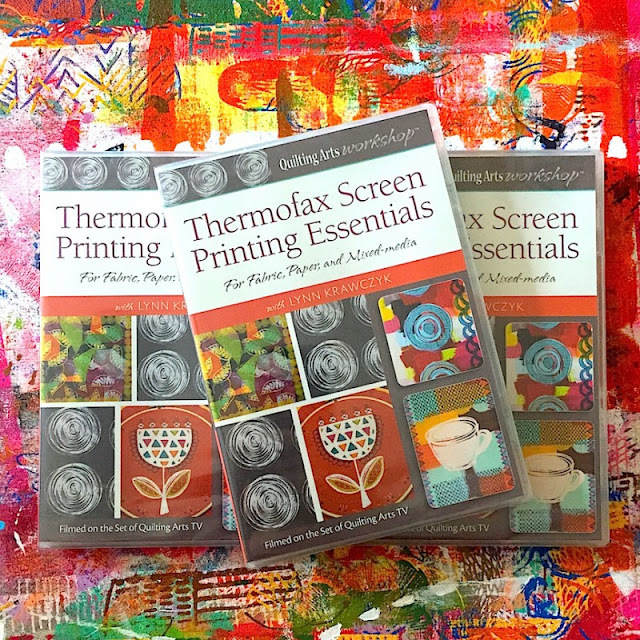 I hope you are feeling inspired to do some thermofax printing of your own because Lynn is generously donating TWO thermofax screens to one of my readers! Simply leave a comment on this post by midnight (MST) August 25th and you are entered! Be sure to visit the other bloggers in the blog hop for more chances to win fun prizes. Lynn will also be giving away a few copies of her DVD on Sunday! But if you can't wait that long, you can purchase a download of the class by clicking here. I really like the white "moons" under the dark dragonflies! Thanks for sharing your story of creating the bound letters. That's such a thoughtful gift! Nice work! What a unique project to be cherished. I am one of those who think printing is difficult. Would love to win to give it a try. I love the thoughtfulness of this project. Truely a special gift! I have never tried screen printing. It is on my list to try. Maybe this will jump start this girl to do it! Awesome project Lisa... your daughters friend is blessed! And your own special use of the Thermofax is an inspiration for each of us! So many thanks! Screenprinting, and especially thermofax screens are becoming a new obsession. 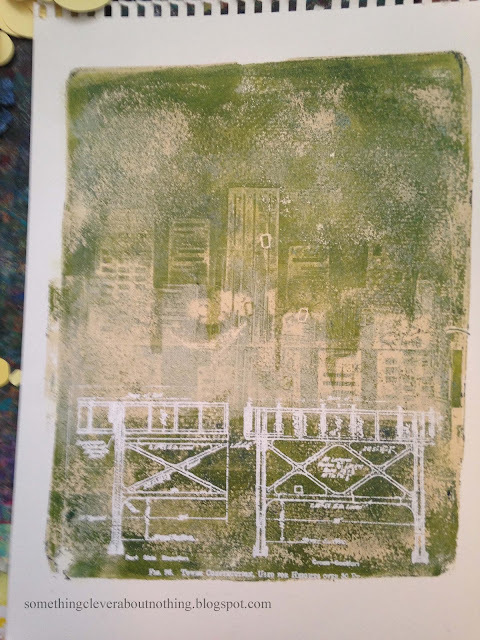 I think using a gelli plate for the background is Avery clever and something I hope to try soon. Great gift! There are so many things to do with thermofax screens! 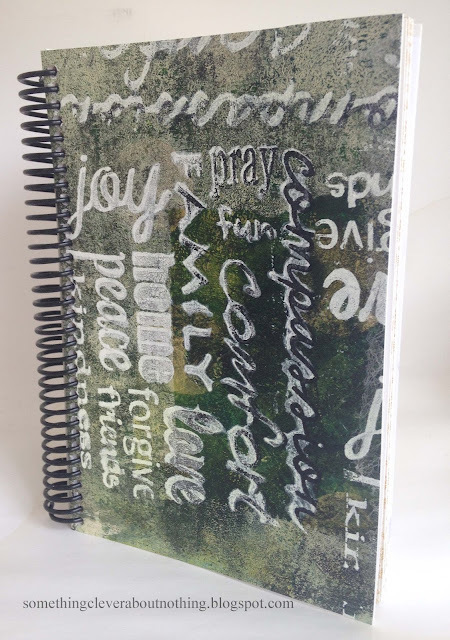 Such inspiration, I can see myself getting into using the thermofax screens with so many different ideas. Thanks for sharing your techniques with us. 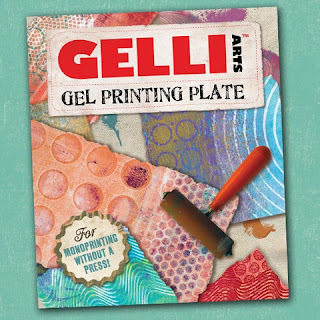 Your gelli prints turned out wonderfully. Lisa, Love how you used those thermofax screens in that book. Thanks for the inspiration this morning! I love the bridge screen! It looks really cute...and love the background of the buildings! NICE NICE! 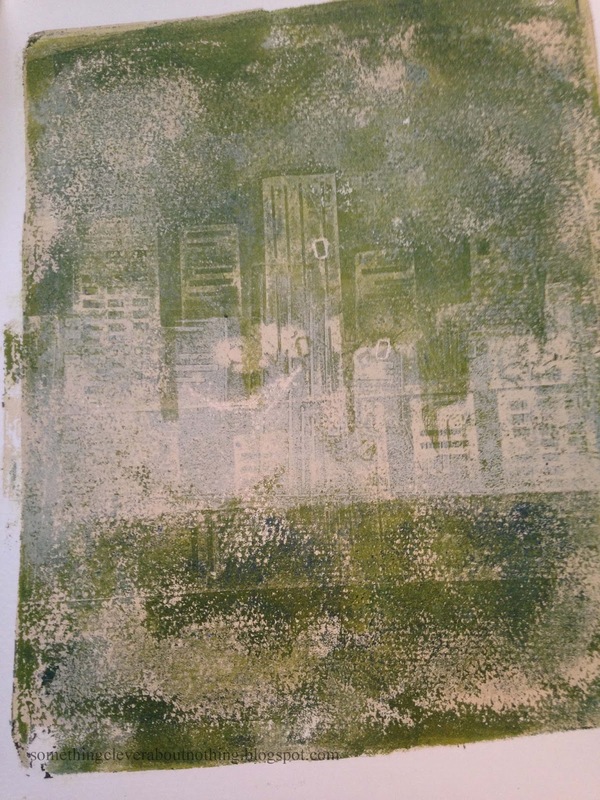 I like the use of the gelli plates and gelli prints as background for the thermofax images. 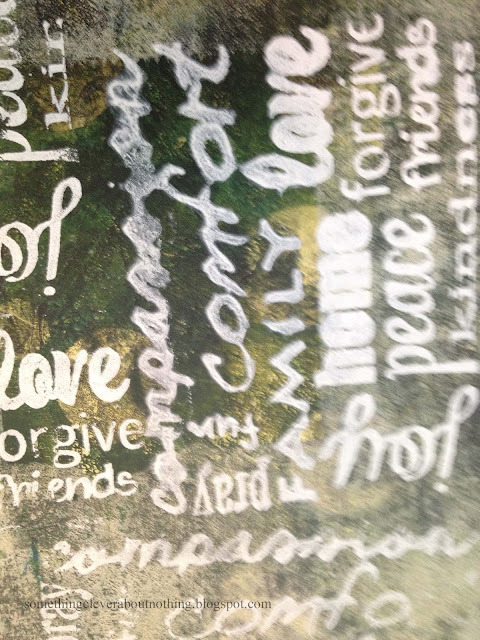 I love what you did with the screens over the gelli prints. And how clever was that "save" for the smudged words! That is a good tip for future "design opportunities" - thanks. It was really great to read of your process. Thanks for sharing . I love the piece and what a cherish memory it will be. I love how you combined several techniques. I have a few thermofax screens but been intimidated to use them. I NEED Lynn's DVD! Cool book idea! My favorite piece in this post is the dragonflies! Love the book--I'm a big fan of Lynn's work, too, and am excited to try some Thermofax printing soon! watching your bookcover develop was So inspiring and encouraging...perhaps I COULD do this gig. This is a lovely project - the colours work so well together. I think my favourite is the city and bridge image. I am itching to try out printing! What a fabulous book - I love thermofax printing too! Loved seeing your process and the final product. Always great stuff! Thanks for sharing your process. Love how you 'saved' the blurred words. I'm sure Lynn makes it as clear and easy as you do - she's good at that. I am loving the screen printing. I definately need to get some screens. Are you selling the dragonfly? Love these covers. Great prints and results. Very thoughtful! Love the architectural elements you added! Lynn was the artist that inspired my love of thermofax years back. I love using the gelli prints as backgrounds for screen prints. 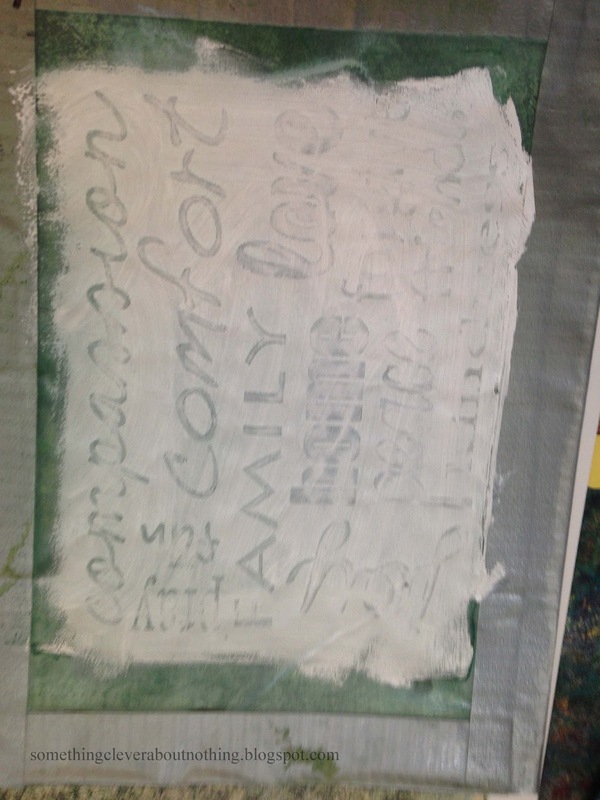 I have been reading about Thermofax printing for a long time and would love to try it! 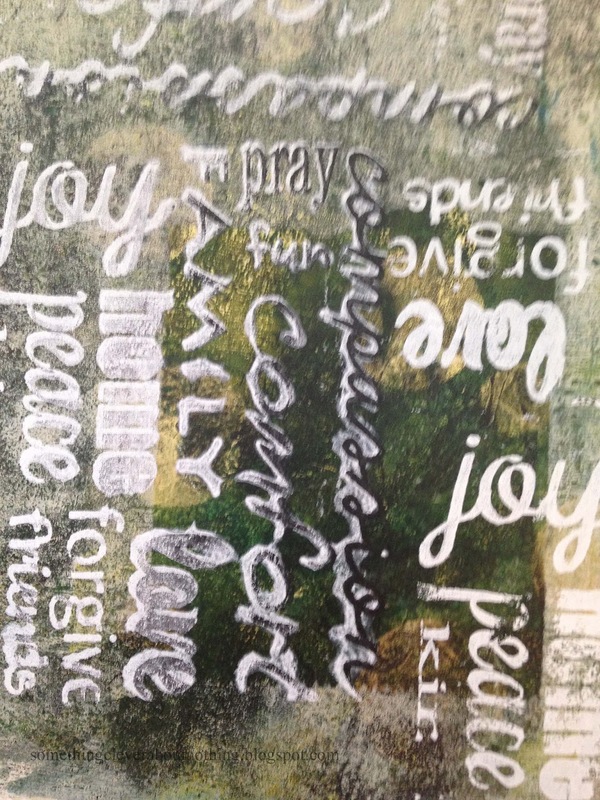 Thanks for sharing your beautiful project and thanks for all the inspiration on your blog! i never had the Chance to get my Hands on thermofax so far... but now i will be on the look-out! your Project is pure Inspiration! What a wonderful memento and unique way to use the screens. Love it! Lovely project - I am sure she will love it! I have been dying to try thermofax printing! Brilliant idea to copy the original fabric on a paper product! Thanks for sharing! I never thought of combining thermofax with Gelli prints. What a great idea! I think your dragonfly page is wonderful! 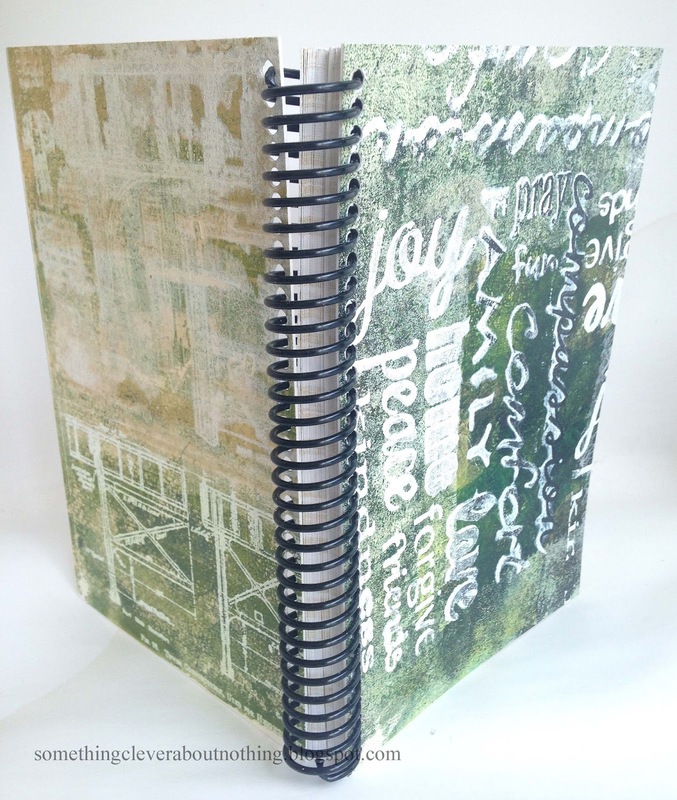 Lots of layers, muted colors and a nice notebook in the end. Thank you for the chance to win. This is a wonderful, thoughtful project, made with love. I am sure that it will become a treasured keepsake. I love all your layers. Thanks for the demo! Very nice job on the book cover. Thanks for showing the mistake (wet brush) and your solution. It is from that type of sharing that we all can learn new techniques and gain new ideas. Thanks so much for a chance to win! I would love to learn more about using a Thermofax! 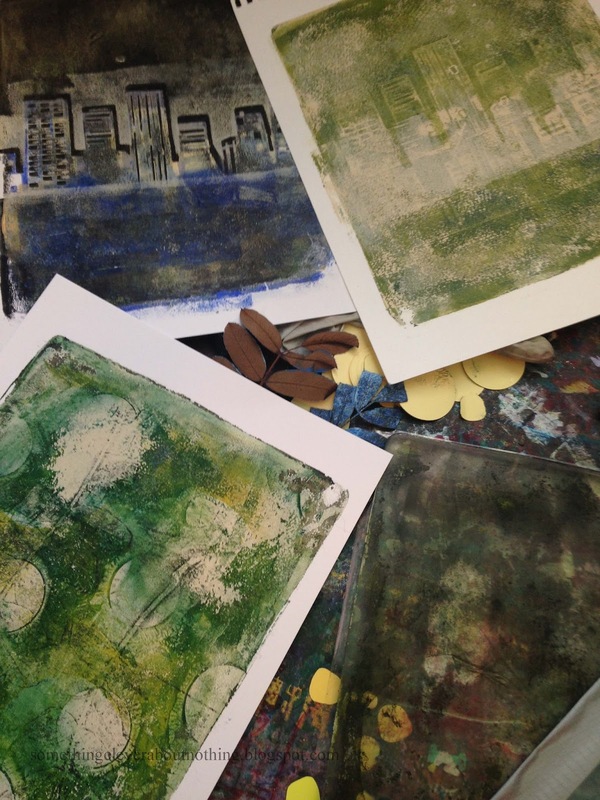 I have used one in mixed media work and loved what I got from the printing. Love your prints and would love to learn how to print with a thermofax screen. What a lovely gift! Thank you for the chance to win the DVD !! Hi Lisa, Love your blog and all your ideas.